This week we’ll feature images of Minneapolis workers, in honor of Labor Day. The 1934 Truckers’ Strike is the the most famous labor conflict in the history of Minneapolis and is now credited with making the city a union town. This strike did break the control of the repressive Citizens’ Alliance. But this one conflict did not make the city into a union stronghold. This epic clash ushered in a period of labor unrest and for the rest of the decade, workers struggled for collective bargaining and higher wages in workplaces all over the city. 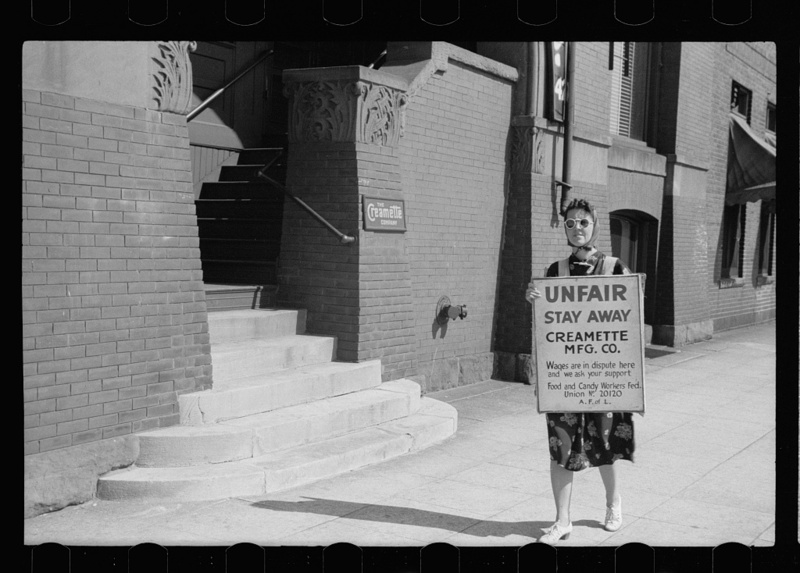 This image from the Library of Congress shows a woman picketing the Creamette Company–known for making macaroni part of an American diet–in September 1939. Photographer John Vachon captured the scene. Interview with Mrs. Charles Godley (nee Scrimgeour) for Old Rail Fence Corners, the ABCs of Minnesota History, which was put together by the historians of the Daughters of the American Revolution. 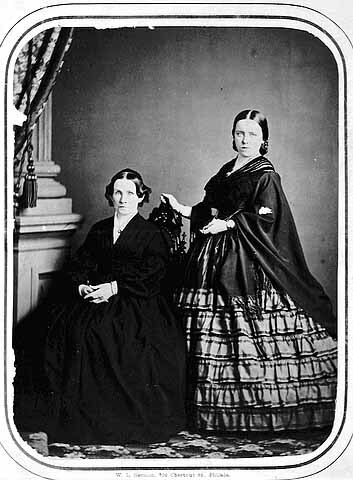 The image of two women was taken in 1860 and is from the Minnesota Historical Society. 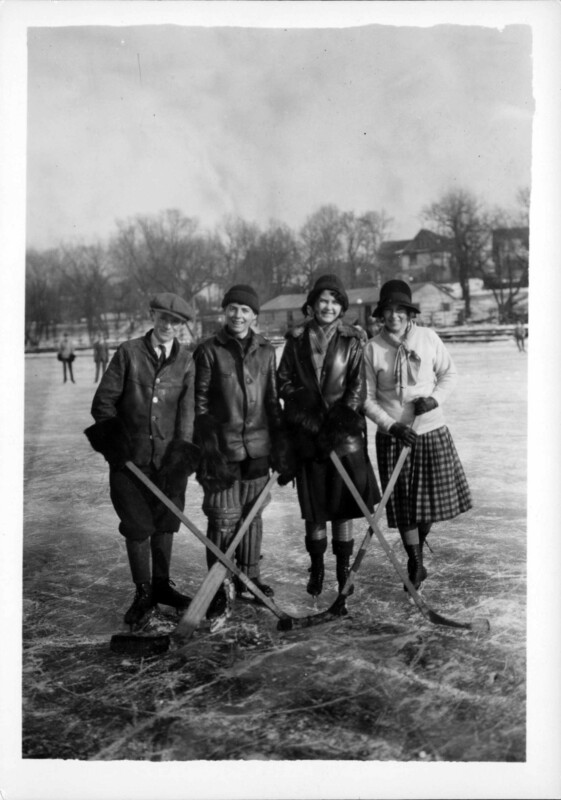 On January 10, 1926, these skaters on Lake of the Isles posed, smiling, with hockey sticks. Two of the players were women. This photo–along with many others from the decade–show that young women across the state were picking up sticks and enjoying recreational hockey match-ups. They were never allowed to shed their skirts for hockey pads or warm trousers. Yet the University of Minnesota recognized women’s interest in hockey during the Jazz Age, starting a club hockey team for women students. World War II interrupted most recreational activities, including hockey. Demobilization brought what Betty Friedan later dubbed the “Feminine Mystique,” an increasingly rigid set of gender roles that emphasized domesticity and femininity for women. As the nation worked to move beyond the crises of war and economic collapse, women were expected to devote themselves to ever-more ambitious homemaking and were forced to give up the autonomy and financial independence they had gained by working in war industries. They were also expected to eschew competitive sports–especially those like ice hockey, which involved physical confrontation. Girls may have skated with their brothers and hit pucks around the city lakes. But their opportunity to compete on ice disappeared, unless they were willing to don figure skates and spangly costumes. In 1972, Title IX was passed, requiring schools to provide equal athletic opportunities for girls. But it took more than a new law to create equal athletic opportunities for girls and women. Minnesota lagged in this regard, especially with hockey. No college hockey team existed for women in Minnesota until 1995, when Augsburg College put female Auggies on the ice. The University of Minnesota started its women’s hockey team in 1997. 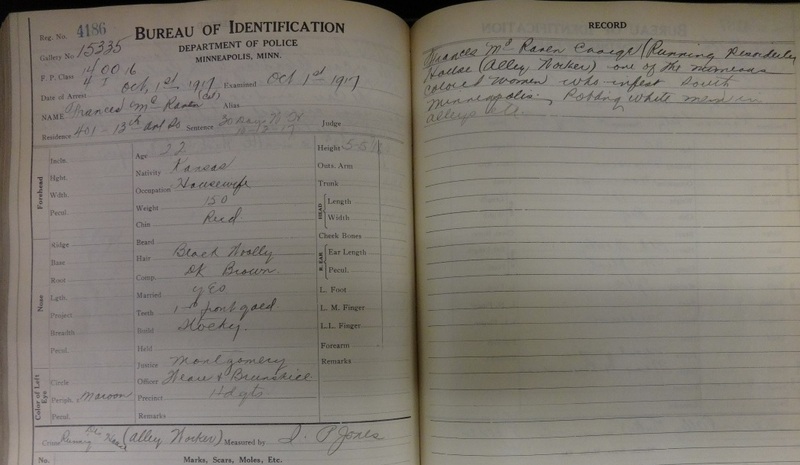 Photo is from the newspaper morgue at the Minneapolis Collection, Hennepin County Central Library. Thanks to Rita Yeada for unearthing this image. And thanks as well to Annika Shiffer-Delegard, who helped me do the research necessary for this post. This advertisement invites anyone visiting Minneapolis to tour the kitchens of Betty Crocker, who was one of the best known and most admired American women in the years after World War II. Crocker was not a real woman. She was the fictional household expert fabricated to personify General Mills, the food processing giant that had consolidated the Minneapolis milling industry during the 1920s. The incorporation of General Mills was a significant turning point for the city, which was struggling to cope with the agricultural depression that had gripped the region since the end of World War I. The new company signaled a shifting economic base for the city, which was transformed from a milling capital to a center for new consumer industries by the end of World War II. The city’s grain mills stayed intact. But business leaders used the profits they had gleaned from milling wheat and timber to create a new generation of industries that were heavily dependent on sophisticated marketing techniques. General Mills sold pancake mix as well as plain flour; it devised labor-saving packaged foods that it had to convince traditional cooks to buy. This economic shift meant that business leaders became increasingly concerned with the national reputation of their city, as the image of the city and the products it products was inextricably connected. Starting in the late 1930s,the business community bought billboards, launched the Aquatennial and then supported the mayoral campaign of Hubert Humphrey, all in an effort to build a new reputation for a city known for labor violence, gangsters and anti-Semitism. By the time this advertisement was published in 1968, Crocker’s kitchens had moved out of downtown Minneapolis to an expansive corporate campus in Golden Valley. A far cry from the old Grain exchange, which banned visitors from the grain trading floor, General Mills worked to lure customers to its headquarters, where they could sample new products. 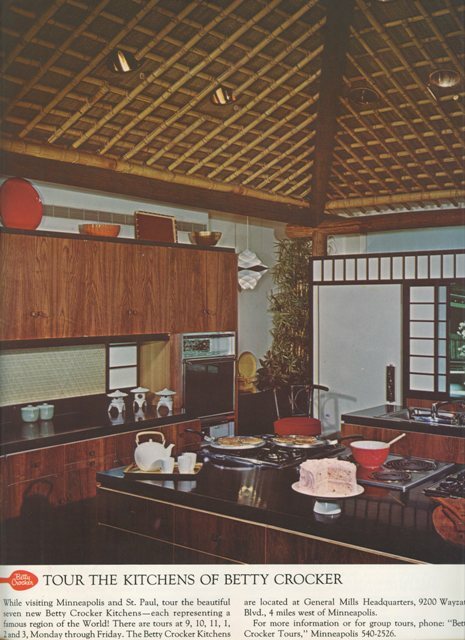 General Mills fashioned itself into a Disneyland-style tourist destination, building a series of test kitchens meant to evoke California, Hawaii, the Arizona Desert, Cape Cod, Chinatown, the culture of the Pennsylvania Dutch and colonial Williamsburg. Tours ran six times a day, Monday through Friday. To arrange a visit they had only to phone: “Betty Crocker Tours,” Minneapolis 540-2526.